Oil on canvas, 24" x 36," 1999. Queer people fought back against police harassment at New York City’s Stonewall Inn in June 1969, launching the modern LGBT liberation movement. The Stonewall uprising began 44 years ago today (June 28, 1969). Their bold rebellion against government persecution of homosexuality is commemorated around the world during June as LGBT Pride Month. 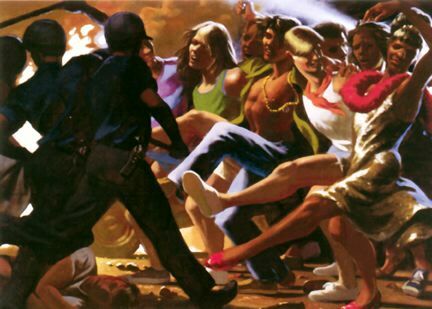 The Stonewall Uprising continues to inspire a variety of art that is featured here today. The LGBT people who resisted police at the Stonewall Rebellion (also known as the Stonewall Riots) are not saints in the traditional sense. But they are honored here as “saints of Stonewall” because they dared to battle an unjust system. They do not represent religious faith -- they stand for faith in ourselves as LGBT people. They performed the miracle of transforming self-hatred into pride. These “saints” began a process in which self-hating individuals were galvanized into a cohesive community. Their saintly courage inspired a justice movement that is still growing stronger after four decades. Before Stonewall, police regularly raided gay bars, where customers submitted willingly to arrest. A couple of dozen acts of resistance pre-dated and paved the way for Stonewall, such as the 1967 demonstration at the Black Cat Tavern in Los Angeles. Despite the progress made, police raids of gay bars have continued in recent years, such as the notorious 2009 Rainbow Lounge raid in Forth Worth, Texas. June 28 is also the anniversary of the 2009 raid on the Rainbow Lounge, a newly opened gay bar in Fort Worth, Texas. Five customers were zip-tied and taken to jail, multiple others were arrested or detained, and one got a severe brain injury while in custody. The raid sparked an unprecedented public outcry that led to historic change. That night 13 people were arrested and some hospitalized. The streets were mostly cleared by 4 a.m., but a major confrontation with police happened again the next night, and protests continued on a smaller scale for a week. A month later the Gay Liberation Front was formed, one of many LGBT rights organizations sparked by the saints of Stonewall. LGBT religious groups are indebted to the saints of Stonewall for our very existence. One of the most significant Stonewall artworks is also the world’s first piece of public art honoring the struggle for LGBTQ equality. 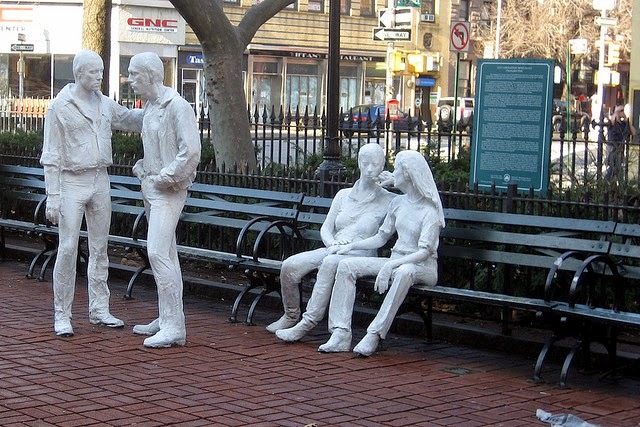 “Gay Liberation” was created in 1979 by famed pop sculptor George Segal. It consists of four statues, a gay couple and a lesbian couple, cast in bronze and painted white in Segal’s typical style. The figures are arranged realistically in casual poses, evoking the power of love with their ghostly presence. The idea for a public sculpture honoring the 10th anniversary of Stonewall came from LGBT activist Bruce Voeller. His vision inspired the Mildred Andrews Fund of Cleveland to commission Segal to create the sculpture. 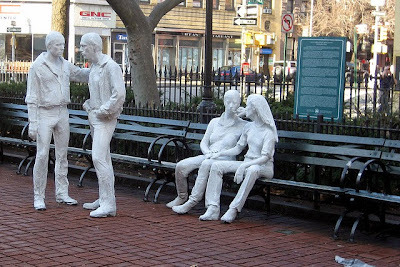 After much controversy, vandalism and alternate locations, the sculpture was installed permanently across the street from the Stonewall Inn at Christopher Park, which also holds two monuments to Civil War heroes. Artists usually choose between two approaches when addressing the Stonewall Uprising. Some focus on the action in the past while others highlight the present-day Stonewall Inn, which is still in operation as a bar for the LGBT community. Artists who recreate the past include Doug Blanchard, a gay New York artist who teaches art at City University of New York and is active in the Episcopal Church. 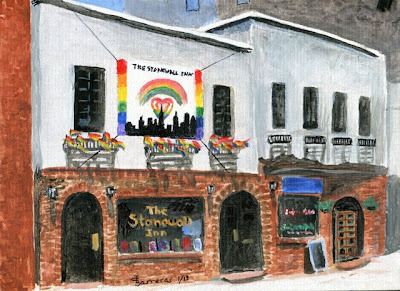 “It was Beautiful” and other Stonewall paintings by Blanchard were shown at the Lesbian and Gay Community Services Center of New York in 1999. His series “The Passion of Christ: A Gay Vision” has been featured here at the Jesus in Love Blog and in a 2014 book with text by Kittredge Cherry. California artist Sandow Birk put Stonewall history into heroic context in a big way. The oil paintings in his Stonewall series measure up to 10 feet wide. The crown jewel of the series is “The Battle of Stonewall - 1969.” It updates the classic painting “The Battle of Mons-en-Pévèle - 1304” by 19th-century French artist Charles Philippe Lariviere. In both cases, the physically superior side attacked those who were considered weaker, but the underdogs won and gained their freedom. Birk replaces swords with police batons and turns national flags into “Gay Power” banners. The knight in shining armor is replaced by a drag queen in mascara and high heels. 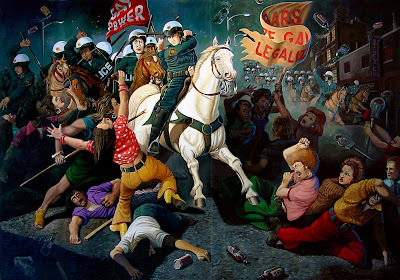 For more about Birk’s Stonewall series, see my previous post: Sandow Birk: Stonewall's LGBT history painted. The location where history happened is emphasized in the colorful painting of the Stonewall Inn by Trudie Barreras, a long-time member of Metropolitan Community Churches. Her art and writing on queer religious themes have appeared frequently here at the Jesus in Love Blog. She also does personalized pet portraits as “donation incentives” for Jesus in Love. British artist Tony O’Connell paid homage to the power of Stonewall by photographing his own personal pilgrimage to the historic bar in New York City in 2013. 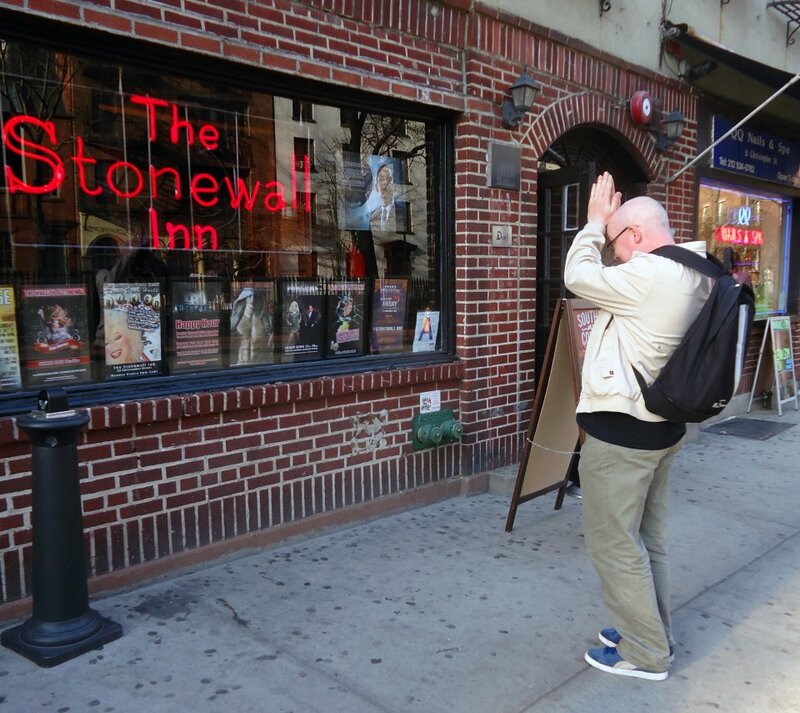 He prayed with incense at the Stonewall Inn as part of his series on LGBT pilgrimages, which he does as performances recorded in photos. He travels to places of importance in LGBT history, treating the trip as a pilgrimage to the shrine of a saint. For more about O’Connell’s pilgrimages and other art, see my previous post Tony O’Connell reclaims sainthood: Gay artist finds holiness in LGBT people and places. 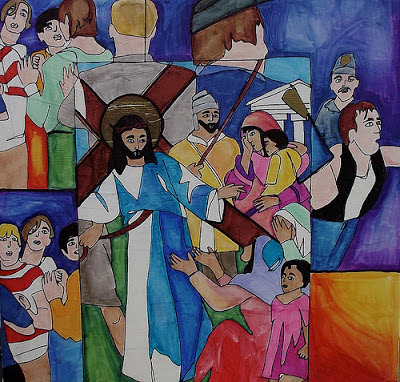 Tennessee artist Mary Button weaves together the LGBT uprising at Stonewall with Christ’s journey to Calvary in Station 8 of her LGBT Stations of the Cross. She shows that a chain of oppression that stretches from the crucifixion of Christ to police harassment of LGBT people today, offering hope for resurrection. For more about Button’s Stations, see my previous post LGBT Stations of the Cross shows struggle for equality. The history of the Rainbow Lounge raid and reaction is told in the 2012 film “Raid of the Rainbow Lounge,” directed by Robert Camina. He says it has “haunting parallels” to Stonewall. Emmy-nominated actress Meredith Baxter narrates the documentary. A video trailer is posted online. May the saints of Stonewall continue to inspire all who seek justice and equality! This post is part of the GLBT Saints series by Kittredge Cherry at the Jesus in Love Blog. 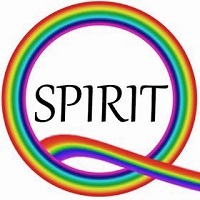 Saints, martyrs, mystics, heroes and holy people of special interest to gay, lesbian, bisexual and transgender (GLBT) people and our allies are covered on appropriate dates throughout the year. As usual, a fabulous post. I am so honored to be included with the others who have recognized this pivotal event of gay liberation.